Sean’s Kitchen has established itself as favourite in Adelaide’s dining scene since it opened almost 2 years ago. It is introducing an express lunch burger menu, available from 11am to 3pm, Monday to Friday. If you’re in need of a speedy but gratifying lunch head into Sean’s Kitchen and make a selection from the Big Book of Booze. Pick up the “Rock In & Roll Out” burger menu presented on a vinyl record and make a choice from the four delicious burgers on offer. With burgers ranging from $10 to $12 and a side of well seasoned Duck Fat Chips for $8, you can’t go wrong. 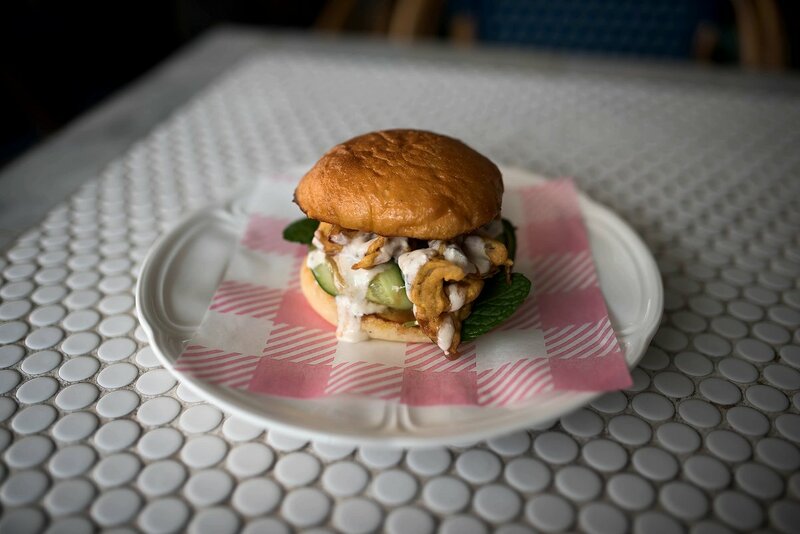 Sean’s Kitchen has covered off on every diet option: an Indian inspired Onion Bahji Burger, a tasty Fish Burger, a southern style Pulled Pork Burger and a classic American Cheeseburger. Instead of going with the ubiquitous vegetarian patty the Onion Bhaji Burger is a refreshing meat free option. Onion Bhaji is a staple entrée on Indian menus. Here, tendrils of spiced onion are deep fried in a chick pea batter to create a crisp nest that is star of the burger. Complemented by ribbons of cucumber, mint leaves and finished with a yoghurt sauce. So flavoursome and fresh yet greatly satisfying, I was half way through the burger before I realised I was eating the vegetarian option. The Fish Burger is a generous portion of fluffy flake in a crisp and golden batter accompanied by shredded iceberg lettuce and thin slices of tomato. 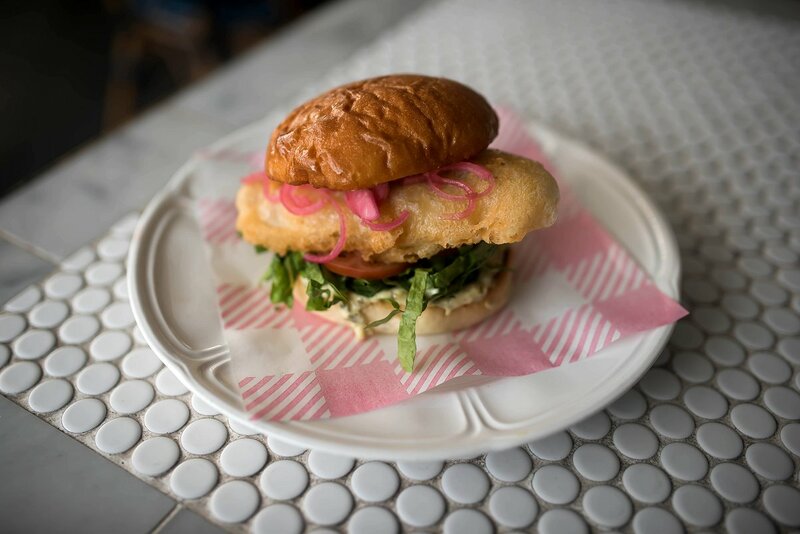 What else would you expect in a fish burger than a dollop of tartar sauce; this one is tangy and studded with capers. 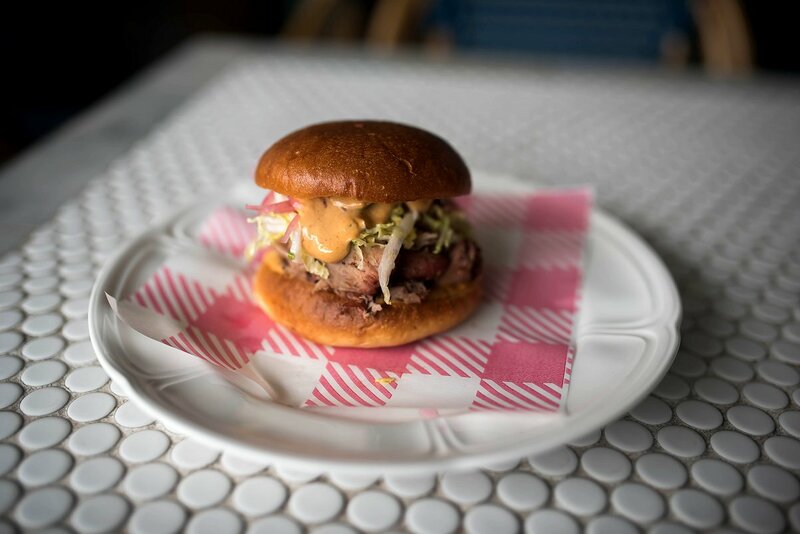 A generous helping of shredded pork is nestled on a bun with picked onions, slaw and jalapenos which give a delectable heat and depth to the Pulled Pork burger. A chipotle mayo binds all the southern flavours together. Some pork escapes the bun and tumbles onto the plate below followed by a drips of the delicious chipotle mayonnaise. This gives me the chance to enjoy the flavor of the meat that is cooked in the smoker that you can see across the road from the restaurant, puffing away on Station Road. It is rich, smoky and tender and I ensure that devour every fallen piece. Tangy mustard sauce drips down the 160 gram Angas beef patty of the succulent Cheese Burger. You can see the gleam of the meat juices but the burger is not at all greasy. The thick beef patty retains a rosy centre and is the perfect host to onions, ketchup and a generous slice of cheese. A cheeseburger would not be complete without pickles and these are cut into long slices, there is sufficient pickle to distribute into every mouthful. 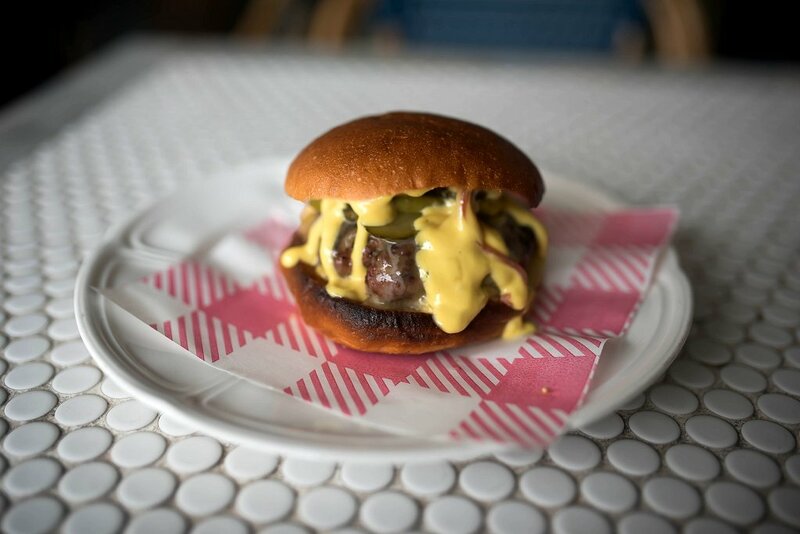 Rather than piling too many ingredients into each burger Sean’s Kitchen have kept each burger refined with complementary but limited ingredients that result in a perfect bun to filling ratio. The brioche bun holds the filling together to the last bite without becoming soggy or dissolving into mushy mess, despite the generous use of sauce in each burger. By not trying them all you are missing out! If you are looking for a sweet treat after your burger feast, then you must try the Sean’s Kitchen Pimped Softee. 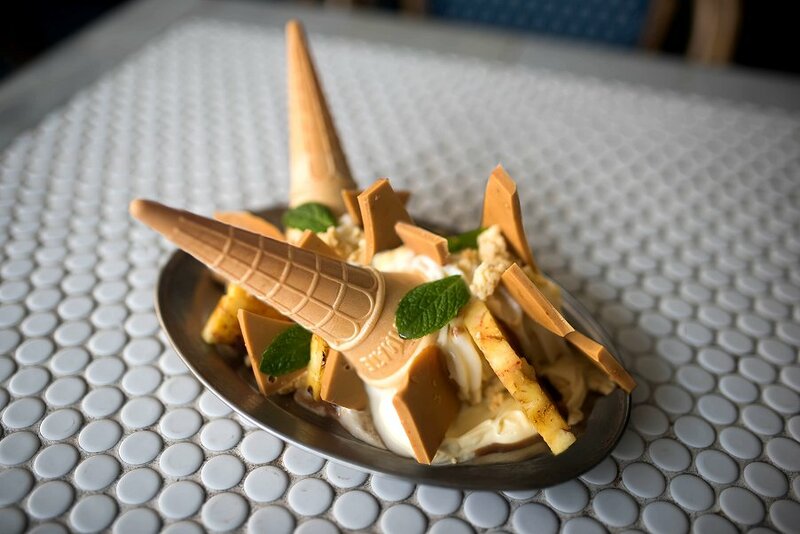 A cone of soft serve Golden North Ice cream is served on a plate and you guessed it – “pimped up” with imaginative ingredients. The flavours change regularly; we’ve seen milo, key lime pie, pavlova and sticky date. On this occasion we had pineapple soft serve, caramelised pineapple pieces, shards of caramelised white chocolate and chunks of homemade shortbread. A sure sign that summer is on the way!